Friday afternoon and I'm waiting for the mechanic to call and tell me how much it will cost to ransom my car -- and I'm trolling the web. And from Fit Bottomed Girls, "We try frozen kefir" - a product which has always been on my "yuck, probably not list". But the write up makes it sound good, and I went to the site and saw I can buy the Kefir mentioned in about a dozen stores by me, so maybe it's time I try it. From the Wall Street Journal lifestyle section Off Duty, "The Type-A Fitness Getaway" which gives readers the low-down on where to go to slim down with shorter, cheaper, resort packages. I'm not sure I consider $3500 for three nights at the Carmel Valley Ranch "cheaper" but the article has a couple of interesting alternatives and each of us has a sense of what's affordable. Anyway, it was a fun read. And speaking of fun reads, did you catch this in the Yahoo! Healthy Living tips? Delicious Foods, Disgusting Ingredients - "You are what you eat” couldn’t be farther from the truth when it comes to today’s over processed junk food...and the disgusting ingredients that are behind those names we really don't understand when we try to decipher the labels of most foods. Yahoo! Shine Senior Features Editor Piper Weiss recently looked at some of her favorite treats and found they are made with some very disturbing ingredients. Be warned, the findings may scare you. Finally, for the other end of the fitness world from the Wall Street Journal, Yahoo!s Healthy Living offers Effective Workout Equipment on a Budget. Just in case you don't want to spend $3495 for three days of luxe fitness, Yahoo! Shine has a list workout gear for a full body workout for less than $100. I got the following email from Lori Myers - (see her blog: As the World Twirls) - and I agree with her: this art is pretty amazing, and it's a great way to support the AIDS Walk SF. Dan Jones drew some pretty amazing charcoal portraits and is donating them to help Jimmy Gale raise money for the AIDS Walk SF. If you want to bid on them, check out the link below. It's an online auction! And if you want to see the portraits (you really do need to see them in person to understand their awesomeness), they are in Pittsburg! Even if you can't donate, please feel free to forward to your friends who might have an interest. THANK YOU! Oh YUM. I just got a new cookbook - more of an idea book actually - that I can't wait to start to try out. (I was headed to the Farmer's Market today but got waylaid by car troubles - otherwise I'd be shopping instead of writing). Anyway, I'm sharing it here to pass along the good word: It's titled "Cookouts Veggie Style" and is by Jolinda Hackett, who is the About.com Guide to Vegetarian Food. There are 225 recipes for cooking veggies on the grill, most of them very easy and inventive and lots of them sounding terrific: Orange Garlic Tempeh, Raspberry Mascarpone on Brioche, Portobello Patties with Pesto Mayonnaise, Orange Sweet Potatoes....there are at least 30 recipes that I found just in a quick glance that I'm ready to start trying. 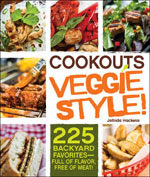 Grilled salads, grilled appetizers, tofu on the grill, grilled fruit and desserts, and some dishes off the grill, this is an idea book for anyone who has been hankering to do more with fresh fruits and veggies. As it happens, just this week I caught an episode of the Dr. Oz show that talked about how grilling meat can produce known and suspected carcinogens and his recommendation was to grill veggies instead. With this book, I say, "AMEN." I came by the book because the PR person sent me a copy , (no promises on my part that I'd write about it,) but this is a book I'll buy and give to friends. It's available at Adams Media for $12.21 which seems a great price for a book that will make a really nice housewarming or hostess gift. Interesting news from the American College of Sports Medicine Annual Meeting: for those recovering from knee injuries, people who pedaled backward on treadmills and elliptical machines tended to do better than those who pedaled forward, as measured by muscle strength and cardiovascular fitness. DENVER – Those recovering from knee injuries might do well to heed research being presented today at the American College of Sports Medicine’s 58th Annual Meeting and 2nd World Congress on Exercise is Medicine®. Those who pedaled backward on treadmills and elliptical machines tended to do better than those who pedaled forward, as measured by muscle strength and cardiovascular fitness. Thirty-nine subjects with various knee injuries were randomly divided into forward- and backward-pedaling groups. All completed 24 supervised rehabilitation sessions which included (in addition to the forward- or backward-pedaling cardiovascular exercise) exercises to enhance strength, balance and flexibility. While the two groups exhibited little difference in balance and flexibility after 24 sessions, those who pedaled backward averaged about nine percent greater aerobic capacity. They also measured higher in improvements in quadriceps and hamstring strength.